A giant step forward? Yes a really giant step forward; a step that exposed a very dangerous lie…a lie so dangerous and widespread that every American evangelist slammed into it. For the very first time in history there appeared to be no place for mass crusade evangelism in the United States, essentially extinguishing the office gift of evangelist. The God-haters seized the day turning soul winning into a hate crime and the Bible into hate speech. The response of much of the church only made matters worse. Many mainstream theologians say that America changed so fast it shocked many pastors. They became frightened to quote scripture or to ask sinners to repent. The “new, improved church” pivoted to messages on self-betterment and gave up on converting unbelievers. They go on to say that not only did celebrity pastors stop winning souls; they openly opposed those who were winning souls. In their growth seminars, they actually warn pastors not to have outreaches. It became so blatant that even atheists began saying that pop preachers are ignorant of the Bible and go on to accuse them of crafting a convenient, compromised, complacent, and counterfeit gospel. For this and many other reasons mass evangelism was pronounced dead. Soul winning messages and altar calls virtually vanished. The end result: a nation purged of morals, self-control and sanity. Our failure to convert Americans is a big reason we are in this mess now. In a nutshell: A generation forgot God, atheists hated God and preachers wanted a crowd more than they wanted God. Mario Murillo Ministries was led in the opposite direction. We knew that this was all a big lie and that the Gospel of Christ which had triumphed over centuries of adversity would prevail again. -We took a stand to declare the unvarnished message of Jesus. -We would present exuberant worship that clearly exalts Christ. -We would preach Bible based messages that take people to the foot of the Cross and then to the Resurrection. -We would surrender to the Holy Spirit to give LIVING PROOF to a lost generation through signs, wonders and miracles. -We would confront pastors with a fiery call to return to their first love. We are not the only ones who have taken this stand! I thank God for Franklin Graham, Rhinehart Bonke and a host of others who continue to harvest souls! God granted us success. However, a big question remained unanswered. Yes, we had good meetings and yes we could attract young audiences but could this weapon called LIVING PROOF rise to the point of piercing the culture and reverse the nation’s course? The answer came like an asteroid striking the earth in Los Banos California. It was here that we first truly saw how an outreach can leave something that would keep expanding. Part 2 of this report tomorrow! Tuesday night said it loud and clear. We asked a question that we always ask: “If you know that you have received a physical healing tonight please stand and give God glory. Nearly half of the entire packed house jumped to their feet to glorify God. That is amazing but even more amazing the harvest of souls. The front was jammed with seekers finding Christ. In fact, it was the largest harvest of souls. The night that should have been the final night showed us why it could not be the final night. The tide was still rising…and not by a little but by a lot. What on earth keeps fueling the flames of revival here? I know what it is…HUNGER! This is not an isolated case. The reports are coming from all directions about sons, daughters, parents, brothers, sisters, friends, coworkers, classmates and even enemies who are suddenly willing to give themselves to Christ after resisting for years. It is in the way that people respond to the moving of the Holy Spirit to receive miracles. There is no need to cajole the audience into obeying God. The ravenously receive. They forcefully reach out and take what Jesus is giving out. It is in the way that they worship and sing. They are pulling heaven down upon themselves. They are boisterous, they are expressive but there is not a hint of freakish behavior just true love and yearning for Christ. These are HUNGER FLAMES! Here is a movement that is hunger based, hunger driven and hunger protected. It is the hunger that is fueling the flames of revival. You cannot stop an army that is hungry for God for all of the right reasons. However it is a hunger for Christ Himself. They love the gifts of power but they love Jesus more. They want Him and they want more of Him. Are you thinking of coming to Los Banos? Prepare for a personal surprise: you will be encouraged. We are a war weary, sin sick nation. We are battered by headlines and an unrelenting storm of bad news. Walk into this meeting and it all drifts away. Hope replaces dread, and bold faith overcomes fear, and many forgotten feelings of peace are restored like a surprise visit from a long lost friend. 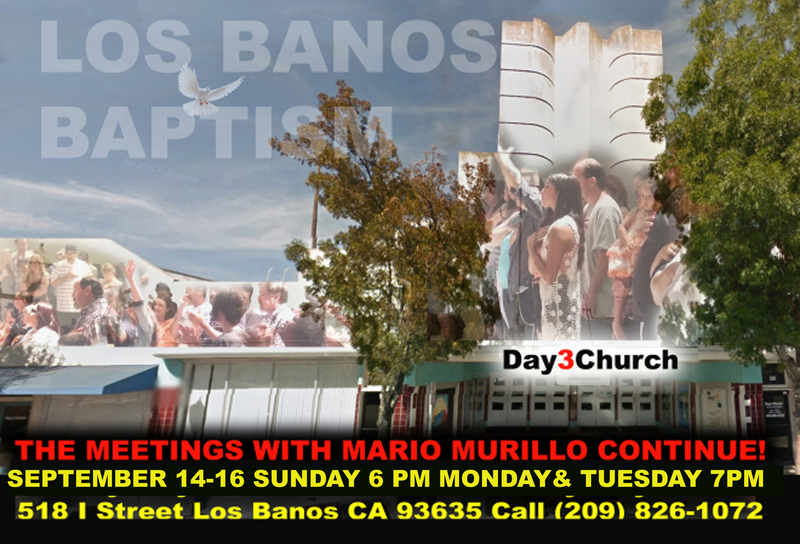 Los Banos California: Here Comes a Baptism of Great Hope in a Dark Time. No one needs to tell you how sad and dangerous the world is right now. The masses, including those in high places have cast themselves head long into extremes of violence, addiction, and even suicide. Good news is rare and would certainly be welcomed. That is why there is something indescribably wonderful about the events that are unfolding in Los Banos California. At the time that we need it most, God is bathing a city with Living Proof of His Love and Power. Moreover, He is doing it in ways that are new to all of us. On Wednesday September 3rd almost 500 people broke away from their jobs, schools and other obligations to walk around the city and ask God to bless all of the people. 500 may not sound like a lot but in this town it was huge! Let’s say that you could have walked among these excited believers and asked them “what has happened to you that you are marching and praying?” The answers would stun and amaze. In fact, they need to be shouted from the roof tops! Their testimonies are the exact thing that America needs to hear right now. Drugs gone, fear gone, sickness gone, guilt gone, and in its place is an unshakable faith for the future and joy in each tribulation. They would tell you how impossible their life once was and how amazed they are each day by God’s mercy and goodness to them. Watch out! Their smile is going to get you! Their story is going to wipe out excuses. This is no escapist religion for the weak-minded; this is LIVING PROOF that operates in the real world. 20 Pastors who had little or nothing to do with each other before this miracle began now have total unity and love for one another. They are herding their people into the meetings and letting Jesus pastor the city! Who should come this Sunday? Those who have been told by medical science that nothing more can be done need to come. Those who have tried to break a destructive habit a thousand times need to come. Those who have been gripped by fear in these explosive times must come. Those who have yearned to see God answer prayer for our nation need to come. Anyone, who has ever stared at the night sky, and felt that there is no God who cares or listens needs to come and have their deepest question totally answered. COLUMBUS, Ind. –Columbus Police said they’ve never had anything like it – three churches vandalized in the same night. Someone spray painted them on the outside. It’s the words used, though, that have some people asking if this was more than a prank. Parishioners saw that, along with the word “Qur’an 3:151” on their way into mass Sunday morning. Outside East Columbus Christian Church and Lakeview Church of Christ, members there found the same kind of graffiti Sunday morning. “Is there somebody that really believes this that we’re all infidels so they felt the need to write it all over our church? “ asked Father Marcote. “Is this some sort of nasty prank? Is this someone that’s trying to incite people against Muslims? I mean I don’t know,” he added. Columbus Police said they’re looking at surveillance video to help figure it out. Until they do though, parishioners at Saint Bartholomew’s have been unsettled by the defacing of their church, at the very least. “There’s a lot of bad stuff being done in the name of Allah and so when people see this happening in Columbus, whether that was truly the person’s intent or there’s something else going on, It makes people nervous. It makes people upset. It makes them scared,” said Father Marcotte. Columbus police would not comment on whether they had alerted federal authorities to the vandalism because of its nature. The priests at Saint Bartholomew’s said they’ve been contacted by members of the local Muslim community in Columbus who have condemned the vandalism and offered to help clean it up.